Flea collars and other pest control systems can be dangerous, especially to young kittens. However, no one wants to let fleas overtake a home. There is a solution, though, a natural one that won’t harm humans or kittens: lemon juice. Fleas hate citrus products, and mixing lemon juice and water is an effective repellent, but lemon juice can also be used to help kill a current flea infestation. Inspect your kitten to make sure it’s fleas you’re dealing with. Other conditions can make pets itchy, and fleas are small and hard to see. 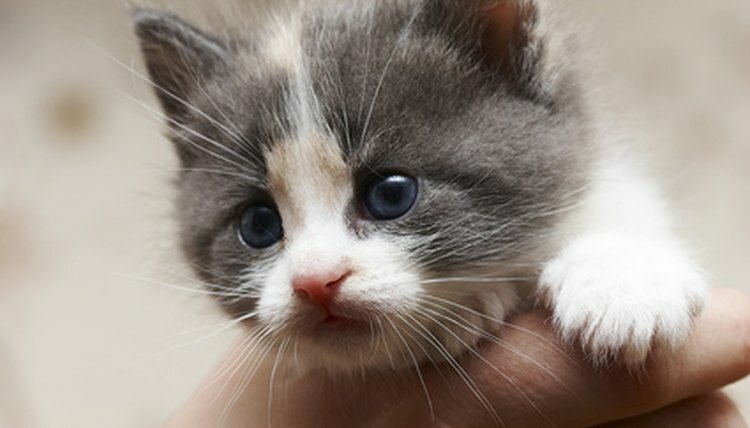 Check your kitten by inspecting its chin, neck, around its ears, or under its front or back legs. Fleas are especially attracted to these areas and they leave behind “flea dirt”, which looks like black spots, pebbles or flakes. Wipe the area with a paper towel and if you find that the flea dirt has turned red on the towel, you’ve hit fleas. Mix 1/4 cup of lemon juice into 2 to 3 cups of baby shampoo. The lemon juice repels and kills fleas and the shampoo smothers them. Mix this ahead of time as you won’t be able to with a handful of wet, squirming kitten. Fill a sink half full with warm water. Most cats don’t mind baths all that much, but running water will scare them. Running the water beforehand keeps things calmer all around. Bring in the kitten and place it in the water. The fleas will start heading for higher, dry ground, so it’s important that you quickly wet and lather the neck area, chin and top of the head. Be careful not to get shampoo in your kitten’s eyes, nose or mouth. Work your way down the kitten from the head, lathering in the shampoo. Get under the arms and the tail, as well as under it. Let the shampoo sit for at least a full minute before rinsing the kitten by scooping the water up with a cup and pouring it on the kitten’s fur. Rinse thoroughly and then dry the kitten well, giving it a warm place to finish drying off. The same thing can be accomplished with any liquid dish soap or herbal shampoo that contains citrus oils or even citrus scent, as well as lavender, eucalyptus, citronella or juniper oil.